A new phase in the Venezuela crisis started last month when Washington recognised opposition leader Juan Guaidó - who is the leader of the National Assembly - as the rightful head of state. With Mr Guaidó leading the charge with protests in Venezuela and a wide range of international support - which includes the European Union and regional players like Brazil, Argentina and Colombia - Washington hopes it won't be long before it achieves its goals. 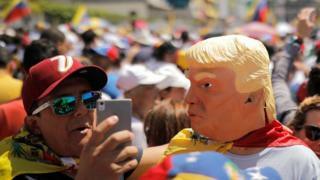 In the past, US action in Venezuela helped Mr Maduro - and President Hugo Chávez before him - to rally Venezuelans behind a common enemy, giving them a temporary boost in popularity. That could be the case now.